Cut each chicken breast in half horizontally into 2 thin breasts. Set aside. Place the red pepper, courgettes and 3 sprigs of thyme in a roasting tin, drizzle with 1 tbsp Rapeseed Oil and season well. Cook for 20 minutes, turning after 10 minutes. 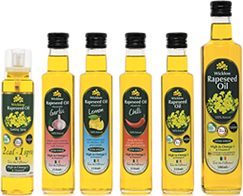 Remove from the oven, add the chicken breasts to the tin, squeeze the lemon juice over the chicken, drizzle with the remaining rapeseed oil and season well. Return to the oven and cook for a further 10 minutes until the chicken is cooked through and there is no pink meat. 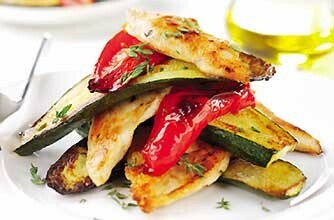 To serve, layer the chicken pieces and roasted vegetables in a stack and garnish with thyme. Roasting the chicken and vegetables together makes this an easy dish to prepare. To serve layer the vegetables and chicken for a contemporary 'stacked' look. You can vary the vegetables according to the season but remember to adjust the cooking time accordingly. Combine vegetables that require equal cooking. Instead of chicken, try using meaty fish fillets like salmon or cod.